I saw a friend posted a picture of his Bo Tai Chanh on Facebook last night. I literally stared at the screen in a dazed, it looked amazing! I could not stop thinking about it all day, all I want is some of that fresh tender sliced beef marinated in that tangy dressing. I could taste the spicy coriander leaves, sweet juicy onions, and fresh roasted crushed peanuts just thinking about the dish. I wasn't going to fight myself so off to the grocery store I went. 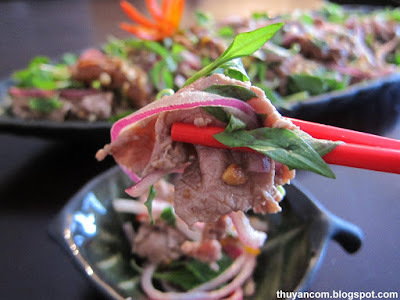 Since I already posted a recipe for Bo Tai Chanh, I decided to make something very similar. 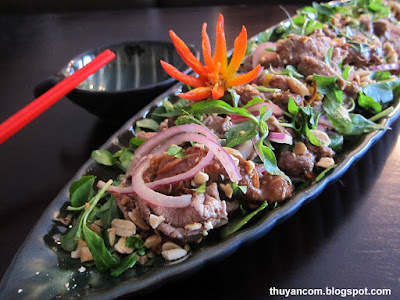 A while ago I had a dish at a local Vietnamese restaurant called Bo Tai Me. It tasted very similar to Bo Tai Chanh but with a hint of Me (tamarind). Even though it was called Bo Tai Me, I could taste the lime juice and it somewhat overpowered the tamarind flavor. For this recipe I really want the tamarind to be the star, I used less lime and a lot of tamarind. I hope you enjoy this refreshing dish as much as I did. 1. In a pot, bring the tamarind juice, fresh tamarind pod, and a 1/3 of the jar of tamarind concentrate to a boil. 2. Dip the 4-5 pieces of thinly slice beef into the tamarind boil for 5 second, remove and place in a mixing bowl. Repeat with the rest of the beef. I like my beef a little rare but everybody is different so how long you cook the beef is up to you. 3. Squeeze excess liquid from the beef, and have it ready in a mixing bowl. 4. Marinade the red onions with 1 tablespoon of sugar and 1/2 tablespoon of vinegar. 5. Mix 1 tablespoon of tamarind concentrate and 1/2 tablespoon of sugar together. This will be your dressing. 6. Add 1/2 tablespoon of fish sauce and all of the tamarind dressing to your sliced beef, mix well. 7. Add the red onion and chili to the beef and mix again. 8. Taste and add additional fish sauce and tamarind concentrate if needed. 9. Right before you serve toss in the chopped coriander, and the juice of 1/2 a lime. 10. Top your salad with crushed roasted peanuts and more coriander leaves you like. I tried this Bo Tai Me. i love it. my husband loved it. im so happy i found your blog. i will try lots of your other recipes. im eying BO LUC LAC . will let you know the outcome. thanks again. Hi Thuy, your dish certainly looks appetizing. I think I can eat a big bowl of rice with it. I do a lot of wok cooking myself. Thanks for sharing.